The world has gone digital. Albums became CDs, which became MP3s. Books have been digitized. Even mine has. Many cyclists prefer to use their GPS than having to carry paper maps. But just as I love the look of an album cover and the smell of a printed book, I adore maps. Physical maps. Maps that fold and sometimes tear. Maps that wear the dirt and grease smudges of adventurous travels. Maps of places I dream to travel that I can pin up on my wall. Every trip I’ve ever taken has begun with my gazing at a map. But of all the maps I have (and I have boxes full of them), I do have a favorite. It is no bigger than three by four inches. It was drawn for me by a man I met on the road in South Africa. He was trying to describe which route I should take. I kept getting confused with his instructions. He pointed to my small notebook and asked for a pen. After a couple of minutes he handed it back to me. A little piece of art with the information I needed. 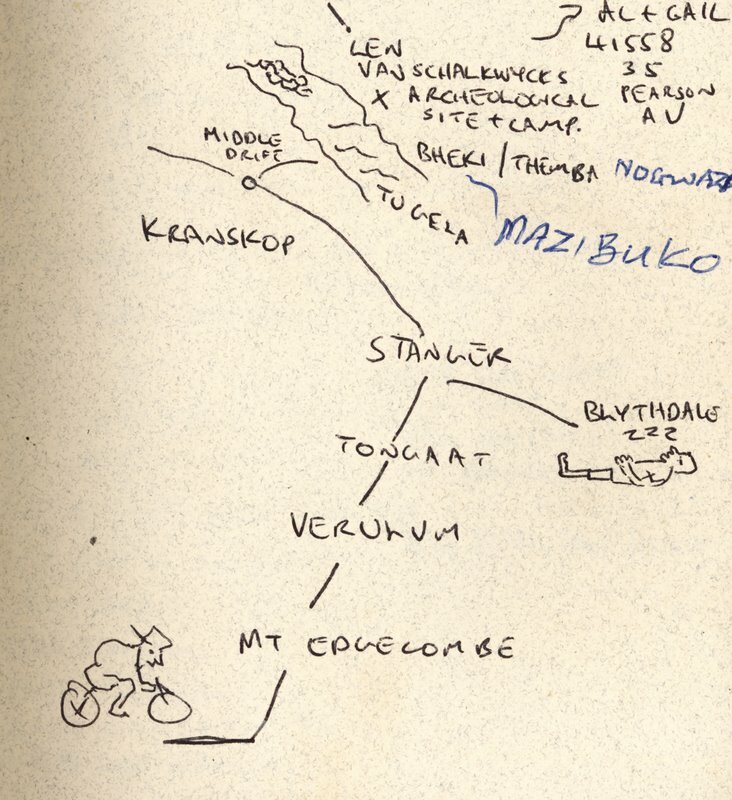 There was me on my bike, the town I should sleep in, and the way to the Tugela Valley. But that was many years ago. Today, no matter where I travel, a local is more likely to pull me inside to their computer and bring up Google maps than to draw one in my notebook. That’s pretty amazing. But I still miss the feel of a map. I’ll admit to being a bit of a Luddite. I’d prefer a sketch on the back of an envelope to a GPS any day. (Having said that my survival has never depended on my getting the directions right). If I check Google, I always end up making myself a mudmap instead of printing the page. Life always seems to have so much more potential when you don’t have every little detail accounted for.